Issue 7/2015. I am realizing that we are a little behind with our weekly paper review and I hope that we can use the month of July to catch up. Our publications of the week include functional studies on CDKL5 targets that may suggest future therapy development, the recessive/de novo paradox of KIF1A and an attempt to understand the genetics of familial cortical tremor. CDKL5. De novo mutations in CDKL5 are one of the most common causes in girls with epileptic encephalopathies and I have to admit that CDKL5 is one of the genes that has not been featured all that frequently on our blog. In a recent study in Neurobiology of Disease, Fuchs and collaborators examine one of the downstream targets of CDKL5, the glycogen synthase kinase 3 beta (GSK3B). It had been shown previously that GSK3 beta is upregulated in a mouse model of CDKL5 encephalopathy and that this upregulation was paralleled by a reduction of neuronal precursor survival and maturation. 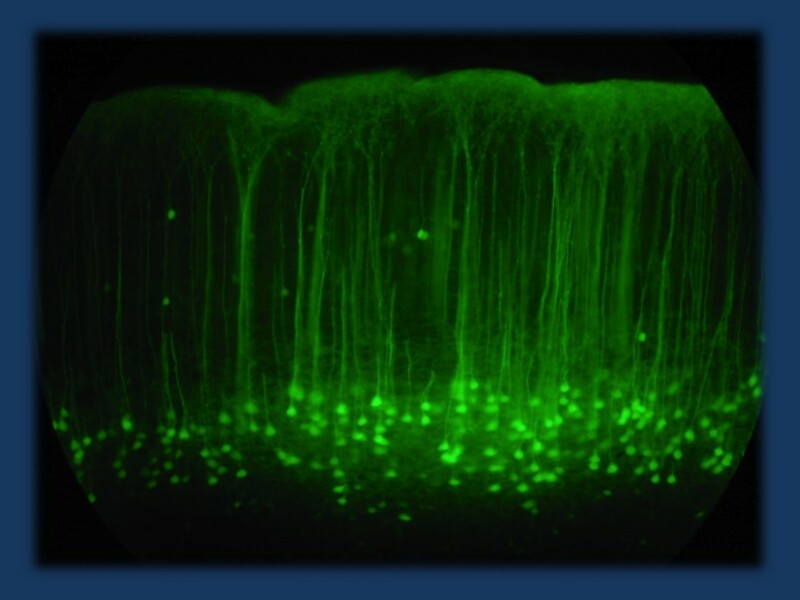 By inhibiting GSK3 beta, Fuchs and collaborators demonstrate that blocking GSK3 beta actually reverses some of the hippocampal development defects seen in the CDKL5 model. Comments IH: The current study is a nice example of how to turn haploinsufficiency into drug targets. While there are few strategies to restore CDKL5 expression, inhibiting some of the downstream targets that are overexpressed may be an interesting direction of future research. KIF1A. Recessive mutation in the gene for kinesin, KIF1A, has been implicated as the causative gene for SPG30, a recessive form of hereditary spastic paraplegia. In a recent study in the Annals of Clinical and Translational Neurology, Esmaeeli and collaborators now discover de novo mutations in a neurodevelopmental syndrome consisting of intellectual disability, microcephaly, movement disorders, seizures and progressive cerebral and cerebellar atrophy. Only some of the children had spastic paraplegia, the phenotype that the KIF1A gene was initially associated with. Kinesins are important for synaptic vesicle transport and the authors demonstrate that the functional consequence of the de novo mutations is much more severe than the effect of the recessive mutations. Comments IH: KIF1A encephalopathy is an interesting example of how both recessive and de novo mutations within a single gene can be pathogenic. There are various examples for de novo mutations in recessive genes in patients with neurodevelopmental disorders and epileptic encephalopathies. It is also a good reminder that there is an interesting and poorly understood overlap between the spastic paraplegias and epileptic encephalopathies, as for example in AP4S1. Familial cortical tremor. Familial cortical tremor or familial adult myoclonic epilepsy (FAME) is one of the epilepsy-related neurological conditions that still remains unsolved. In a recent publication in American Journal of Medical Genetics Part B, Cen and collaborators take another stab at trying to identify the underlying genetic alteration in a family with 9 affected family members, including genome sequencing and copy number variation analysis. Results: nothing. The identify a linkage region on chromosome 8q22.3-q24.13, but the authors have little evidence that any of the variants that they identify is causative. Comments IH: Familial cortical tremor or familial adult myoclonic epilepsy (FAME) remains one of the familial conditions to be solved. The familial disease usually starts with tremor in early adulthood in the affected family members, even though a wide range of age of onset is observed. In some families, only a subset of all affected family members have seizures. Through our Israeli Epilepsy Family Project we are involved in an international consortium that aims to decipher the genetic basis of familial cortical tremor that is coordinated by Mark Corbett and Jozef Gecz in Adelaide. Let us know if there are additional families that you are aware of that may help us find the elusive gene for this condition that appears to be particularly difficult to track down. This entry was posted in 2015, Epileptic encephalopathy, papers of the week, Publications and tagged CDKL5, FAME, familial adult myoclonic epilepsy, familial cortical tremor, GSK3B, KIF1A, Rett Syndrome. Bookmark the permalink.